Citigroup Inc. is planning to join UBS AG with an electronic currency trading and pricing platform in Singapore, setting up systems to boost liquidity in Asia’s biggest foreign-exchange hub. Laws being drawn up to counter the scourge of fake news will “not be sufficient” and everyone has to play their part to protect Singapore from the danger it poses, Minister for Communications and Information S. Iswaran said on Monday (March 11). The Singapore doctor embroiled in the leak of confidential HIV patient data has lost his appeal in the High Court against an earlier conviction of helping his partner to cheat on a blood test, and of providing false information to the police and Ministry of Health (MOH). The Monetary Authority announced yesterday Wednesday 6th March that they were making organizational changes to strengthen its leadership as well as setting up a new technology group (TG). The Ministry of Law is seeking public feedback on a draft Bill that will centralise the hearing of most civil intellectual property (IP) disputes in the High Court. Patients at hospitals, polyclinics and some specialist centres under the SingHealth group of healthcare institutions can now get their prescription medication delivered. Not content with just being the best layover airport in the world, Singapore Changi Airport is blowing all other airports out of the water with its latest extension. More people are reporting bad behaviour on the roads to the Traffic Police (TP), and the number of summonses related to public feedback has increased 1.5 times over the past five years. Online fraudsters find Singapore to be the easiest place in the region to set up shop, according to a cyber-security firm. Singapore’s latest decision to shell out billions for new F-35 Joint Strike Fighter aircraft from Lockheed Martin was not aimed at China, claimed the city state’s defense ministry, and Chinese papers also moved in concert to quash speculation in the US media linking Singapore’s purchase of advanced fighters to the People’s Liberation Army’s increasing pull in the region. Inflight meal caterer SATS is boosting its overall food production by 14 per cent, with a S$25 million facility that launched on Monday (Mar 11). Last Thu (7 Mar), Bloomberg published a news article revealing that Singapore’s GIC will be investing Rs5,000 crore (S$972 million) into the troubled India’s second largest telecom company, Bharti Airtel Ltd.
SINGAPORE: Embattled water treatment firm Hyflux is postponing Wednesday’s town hall meeting due to the need to secure a “larger venue”, it said in an announcement late on Monday (Mar 11). US-based meat alternative firm Impossible Foods has finally confirmed that it has expanded its footprint into the Singapore market through its foodservice channels following months of rumours. If this year’s Budget goodies were part of a “cynical election scheme”, the $6.1 billion Merdeka Generation Package would never have been budgeted for, said Speaker of the House Tan Chuan-Jin on Friday (March 8). Will potential white knight investor rescue Ezion from the red? DBS Vickers Securities is reiterating its “hold” call on Ezion Holdings with a target price of 5 cents, which is based on 10 times FY20 fully-diluted earnings after lowering FY20 earnings forecasts by 45%. Explainer: What is the relationship between one’s retirement age and CPF payout eligibility age? The issue of the minimum age at which an individual can receive payouts from his Central Provident Fund (CPF) savings has resurfaced after Manpower Minister Josephine said in Parliament on Tuesday (March 5) that the retirement and re-employment age will be raised, though no details were given. The holders of Hyflux’s perpetual securities and preference shares will get back slightly more cash under a rejigged restructuring plan, but experts are split on whether the improved terms will be enough to persuade these junior creditors to give the ailing water treatment firm a second chance at next month’s do-or-die vote. Yahoo Poll: Will you miss the SAFRA Singapore Bay Run and Army Half Marathon this year? The Singapore Armed Forces (SAF) will not be holding its annual SAFRA Singapore Bay Run and Army Half Marathon this year, as the Army will be involved in supporting the Singapore Bicentennial commemoration. Singaporean Defense Minister Ng Eng Hen announced a plan to buy up to 12 F-35 warplanes from the US in his Ministry of Defense Committee of Supply debate speech on March 1. Local companies seeking to break into foreign markets must team up instead of treating each other as rivals, Finance Minister Heng Swee Keat said on Friday (March 8). Construction firms will soon be able to tap a new S$2 million fund to help them acquire quieter equipment and adopt more innovative building methods. Is our union & Manpower Minister protecting our working class? For younger Singaporeans, many may wonder who or what National Trades Union Congress (NTUC) is all about. THE Ministry of Law (MinLaw) is seeking public feedback on a draft Intellectual Property (IP) (Dispute Resolution) Bill, consultations of which will conclude on April 5, 2019. Citigroup is planning to join UBS with an electronic currency trading and pricing platform in Singapore, setting up systems to boost liquidity in Asia’s biggest foreign exchange (FX) hub. On 9 March (Saturday), Home Affairs Minister K Shanmugam revealed that he don’t understand how the Swedish black metal band Watain could have been allowed to perform in Singapore given the band’s anti-Christian song lyrics. Which markets face the most risks as frontiers drown in debt? With a steady build-up of public debt becoming increasingly held by private creditors, frontier markets (FMs) are outpacing their emerging market (EMs) counterparts to become more and more vulnerable to global financial shocks. Several Singaporeans have criticised Speaker of Parliament Tan Chuan-Jin’s claim that Budget 2019 is not an ‘election budget’. The National Council of Churches of Singapore (NCCS) issued a letter thanking the Government for cancelling the concert of Swedish black metal band WATAIN just hours before it was scheduled to be held on March 7. Following an outcry from the medical community, the Ministry of Health (MOH) is looking into the Singapore Medical Council (SMC) decision to fine a psychiatrist S$50,000 for failing to maintain patient confidentiality. After finishing a 12-kilometer march, the Singapore Armed Forces’ (SAF) latest recruits graduated on Saturday, March 9, 2019. Some 3,500 soldiers from the Basic Military Training Centre attended the parade at the Marina Bay floating platform. In light of calls for the Government to devise “more universal and permanent schemes” for Singaporeans instead of what some have dubbed as temporary schemes tailored to lure in voters before every General Election, Speaker of Parliament Tan Chuan-Jin said that contrary to such opinions, the Government already has a history of implementing such long-term schemes in the past. A doctor at the centre of the HIV data leak from Singapore’s registry told the High Court on Monday (Mar 11) he had lied to the police in 2016 when he admitted to cheating offences. The Court of Appeal on Monday (Mar 11) dismissed a bid by prosecutors to send an intellectually disabled teenager to prison and caning after he raped and sexually attacked his schoolmate. Considering the stature of wealthy nations like Singapore and Hong Kong, their corresponding governments are in better position to institute and influence change across the region regarding essential issues. Prime Minister Lee Hsien Loong will deliver the National Day Rally speech on Aug 18 this year, said the Prime Minister’s Office on Monday (Mar 11). The 15th Institute of Public Relations (IPRS) PRISM Awards on March 7, 2019 (Thursday). Held at the Mandarin Oriental Hotel, the 15th PRISM 2019 had a record-breaking number of entries and nominations for its 32 categories which included eight new categories showcasing the the competencies of PR and Communication organisations within the country. CGS-CIMB Research says current bank valuations have priced in downside risks of a pause in US Federal Reserve rate hikes on sector earnings. On 28 February (Thursday), Worker’s Party’s MP Sylvia Lim questioned in Parliament if the appointment of the new Auditor-General is a conflict of interest. This is because the newly hired Auditor-General Goh Soon Poh is the wife of Senior Minister of State for Defence Heng Chee How. At this digital arts workshop, there are no crayons and paper. Instead, participants create drawings on iPads, and also pick up media literacy skills along the way. To reduce waste, Sats, a major player in the food industry and Changi Airport’s main airline caterer, has invested in new technology to extend the shelf life of cooked food, which, as a result, helps to cut wastage. SATS plans to tap the rising demand for ready-to-eat meals. 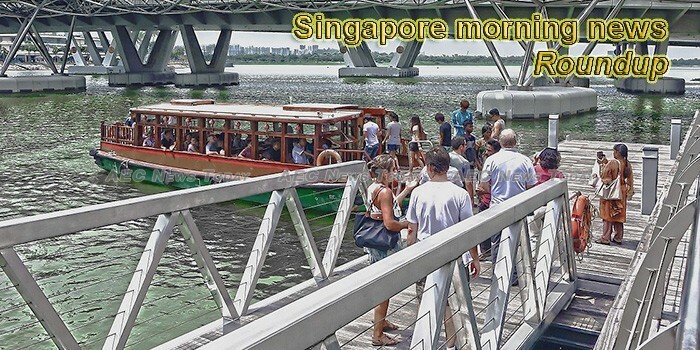 Everyone knows that Singapore is among the top tourist destination in the Asia Pacific region. The Singapore Contractors Association (SCA) has brought forward its quarterly safety timeout, as it expressed “grave concern” over the recent spate of workplace fatalities at construction sites, it said in a statement on Monday (March 11). The country’s Minister for Communications and Information, Mr S. Iswaran has announced the news in a speech to Singapore’s parliament on March 4, 2019, that Singapore has added the plan to launch a blockchain-based system in its maritime sector called TradeTrust. Give a man a fish and you feed him for a day; teach him how to fish and you feed him for a lifetime. The migrant workers who gathered outside the site of the old Central Provident Fund building last week were waiting to talk to their employer about their salary claims and were not staging a protest, the police said. My youth was dominated by the Cold War and the war in Vietnam.